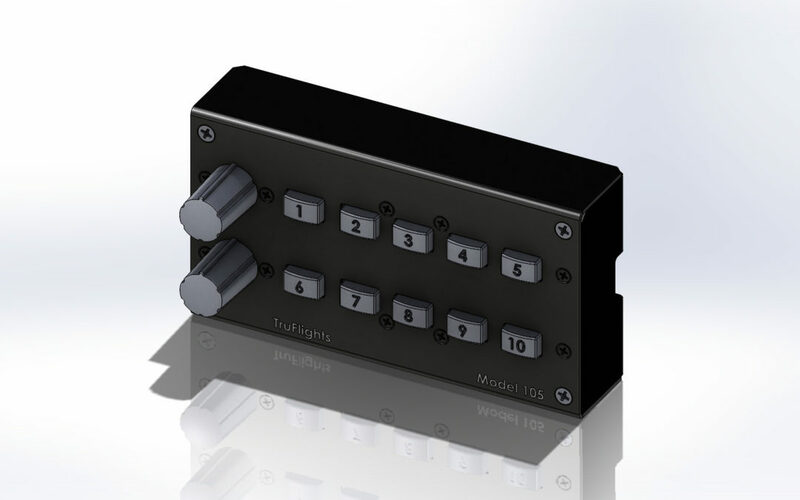 The Compact Control General Input Model 105A, Compact Control General Input Model 105B, Compact Control General Input Model 105C was developed to provide a high density general purpose module. It has ten push buttons and two locations for rotary devices. Whether it’s an A, B, or C is determined by what is installed in the two rotary locations. In last June we attended FlightSimCon and took some of our ideas along like, Flight Simulator Compact Input Controls and Joystick to see if we could get any feedback from the flight simulator enthusiasts. We were very surprised at what we learned and the response we received. While loading the car, Brian decided at the last minute to take along some 3-D printed boxes that he had made. We opened the box with the 3-D printed experiments in it and were not prepared for the excitement they created. Soon we were surrounded by simulation pilots that had all kinds of ideas for control configurations. Some of these pilots were standing and some ended up sitting on the floor just to join the discussion. When we returned home Brian decided to follow through with this idea and proceeded to design a series of control boxes in anodized aluminum cases with assignable controls that would fit conveniently on a desk behind the keyboard. These boxes are self-contained so they can stand alone or be mounted on a piece of wood. He has also designed brackets that can be used to mount the controls. These brackets place the controls at a convenient angle and lift them above the back of the keyboard. The brackets can be used singly or coupled together to create an array of controls. We’re anxious to hear from users so that we can effectively expand the variety of modules offered. If you would like to participate in a discussion please go to https://truflights.com/blog/ .